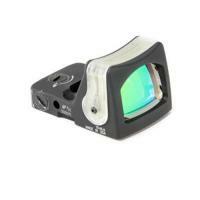 Trijicon RMR Dual-Illuminated Sight - 13.0 MOA Amber Dot FREE SHIPPING! The Trijicon Ruggedized Miniature Reflex (RMR) dual illuminated sight is designed to reliably improve accuracy and target acquisition, while also providing the legendary durability of the classic ACOG sight. Day and night 13.0 MOA Amber Dot Reticles make rapid engagement as easy at night as it is during the day. The user-friendly sighting adjustment system allows for fine windage and elevation control, and its audible clicks provide extra feedback. Permanent tritium illumination and Trijicon fiber optics mean that the sight never loses brightness, so you don't have to worry about changing batteries in the field. The compact, ultra-rugged forged aluminum housing makes the sight extremely strong and lightweight, perfect for enduring the stresses of battle without interfering with the operation of your weapon. This ruggedness makes it ideal for police work, military use or hunting. ©2002-2019 CopsPlus.com: Trijicon RMR Dual-Illuminated Sight - 13.0 MOA Amber Dot FREE SHIPPING!